Meet the Experts at Bechtelsville Agway! It’s almost that time of the year again. April is upon us and you know what that means. It’s time to break out your tools and go to work on your garden. As always, we were forced to wait for Mother Nature to keep up as Spring rolls around while snow may still be on the ground in some areas. However, don’t let this fool you. Underneath that cold earth is a nutrient rich canvas waiting to be plowed and filled with beautiful plants. 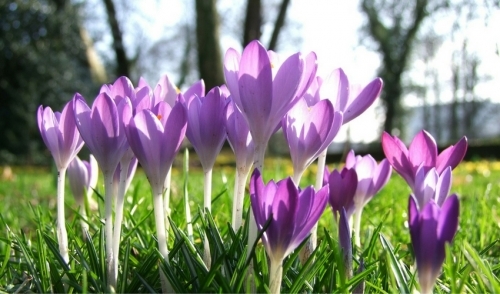 Here are some tips to follow when gardening in April. First, plan for the rest of year. Planning ahead is important. The point is to have a general idea of what colors and plants you want in your garden while also considering the seasons to follow. This means not only picking bulbs, but also looking later down the road to how your garden will appear in the fall going into winter. This will save you time and energy later, especially during those hot summer months. Study your garden and search for where there are gaps where another bulb can be planted and scout flowering trees and shrubs to add more color in the fall. Anything related to your lawn and garden will always be dependent on how well you plan ahead. Preparation is everything! The second tip is to get all of your to-do chores out of the way. This means if you need to remove debris, get it done. Continue to remove any and all winter mulches if you have not done so already and begin digging beds in preparation for planting. Be sure to cultivate flowerbeds and remove any weeds that you can find. If you need to build new ones, then this is the time to visit your local hardware store to get the right supplies to do so. In addition, make sure to test your soil and apply any pest control if it’s already warm enough. Once everything is prepped and ready to go consider planting your first set of plants. This won’t happen at the same time for everyone as we all move to the beat of our own drum and sometimes weather can get in the way. Moreover, when you are ready, sow your hardy annuals and any vegetables that require early planting. For any summer crops, start potting to get them ready for the warmer months. This is also the time to plant any perennials or roses. Another tip is to prune and fertilize where needed. We want our garden to look the best it can so make sure to prune any shrubs that have dead or weak branches. Prune and trim any early flowers that may have already come in and died due to a cold front. Add fertilizer to your bulbs, perennials, and any fruit trees as they begin to prosper so that they thrive in the coming months. Finally, continue to manage and plan for the months ahead. Start your indoor plantings to get ready for the next wave of beauty that is going to hit your garden. Gardening requires love and attention to detail. The month of April is when you will need to give it the most. © 2019 Bechtelsville Agway. All rights reserved.